Replacement visor for Spiromatic and Sari mask assemblies. 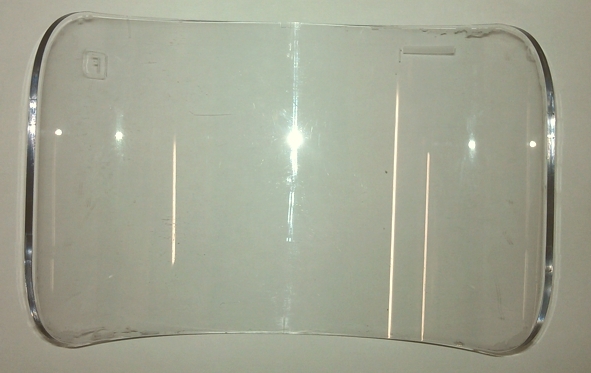 The visor thickness is 2.65 mm. It is optically correct and has a lower refractive index than glass. That said, Polycarbonate is not resistant to organic solvents and it scratches more easily than glass (see the Triplex visor) which should be considered, when solvent resistance is needed. Changing visors at sea, or on site is no problem, taking around five minutes. Tools needed: P2 x 100 Philip's screw-driver, small pry-bar (Flat blade screw-driver will do) and soapy water. Details are published in the Divator, User Manual, issued with every mask. Click the button below to add the Visor replacement, Polycarbonate: Spiromatic/Sari to your wish list.